Sandium Heating and Air Blog: How Much Can You Save With a High Efficiency Furnace? 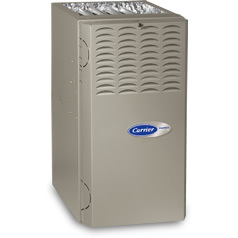 We’re getting into the coldest days of the year now, and a lot of homeowners are being faced with an important decision: my 20 year old furnace is dead, what kind of furnace should I buy? Should I get the cheaper model or the more expensive one that has the higher efficiency rating? Is two stage operation or a variable speed fan worth the extra cost? A good place to start is to figure out your current heating costs. If you use natural gas, what other natural gas appliances do you have? If you’re only other natural gas appliance is a hot water tank, this will typically consume $200-$300 in gas every year. A gas stove will typically consume less than $50 in gas a year. The rest should be used by your furnace. Another method to determine the energy costs of your heating is ask for your month by month energy costs for the last year (or more) from your utility company. The difference between your gas costs in the winter and the summer provides a good estimate of your heating costs. Next, you must estimate what percentage you will save with a high efficiency (90% efficient) or ultra high efficiency (95% efficient) model versus a now minimum standard 80% efficient model. This involves subtracting the lower efficiency rating from the high efficiency rating and dividing the result by the higher efficiency rating. The result is: A 95% furnace should use about 16% less energy than an 80% efficient model and a 90% efficient model should use about 11% less energy. Finally, you can multiply your annual heating costs by the savings percentage to estimate how many years it will take to earn your investment back. People with lower heating costs (smaller houses, warmer climates) might find a furnace that costs $1000 extra will only save them $40 a year, and people with higher heating costs might find it can save them $300 a year. Other issues are deciding whether to pay more for two stage operation or a variable speed fan. If you run your fan continuously in the summer for a mild cooling effect, a variable speed fan will pay for itself in a few years in energy savings. Otherwise, these are luxury items that will make your home more comfortable for a cost.